Summary: Daphne “Dee Dee” Dupree has arrived at age 41 with a career she loves, but a romantic life she doesn’t. Insecure about her weight and protective of her often-broken heart, Dee Dee is an expert at hiding her inward struggles from the thousands of Chicago residents who hear her on the radio every night. A successful, charismatic DJ for the local blues station, Dee Dee is still looking for the type of love she’s missed since her divorce. After a traumatic event at work, Dee Dee meets Skylar, a union mediator who could be just what she’s looking for—if only there weren’t so many obstacles in their way. Meanwhile, Dee Dee’s coworker Jade is nearing her own divorce; her best friend, Sharon, has come out of the closet; and Sharon’s teenage daughter is dangerously close to a breakdown. As Dee Dee works to ease the problems of her friends, she finally faces her own troubles—both old and new. Review: Many of us remember April Sinclair because of her groundbreaking novel, Coffee Will Make You Black, and its sequel, Ain't Gonna Be the Same Fool Twice, in the mid 90s. 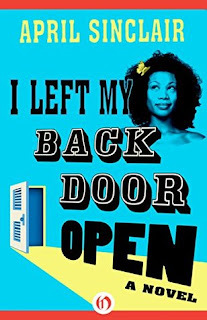 While those novels followed Stevie Stevenson, a nerdy teen growing up in the sixties, moving from Chicago to San Francisco at the height of the Civil Rights Movement, discovering her sexuality, free love and all of the "good times" that came with maturing in the seventies, I Left My Back Door Open is a grown woman's story. Dee Dee Dupree swears she's me! I love a good "smart woman who can't get out of her own way" novel and it's even better when said woman looks like me and is in my age bracket. Dee isn't really looking for love, but she wouldn't be mad if it decided to drop by occasionally. She enjoys good music, good food and the company of friends. See? It me! April Sinclair is on the top of her game with I Left My Back Door Open. Her characters are smart and funny and diverse. From the black security guard who has renounced his blackness and now claims white people as his own to her best friend who went on sabbatical and came back as a card carrying lesbian; her married best friend with marital problems she willfully ignores; her overly hormonal goddaughter who asks for advice and then does the exact opposite, I Left My Back Door Open is an embarrassment of riches. Dee Dee's romance with Skylar is just the cherry on top. I only have two regrets: 1) I didn't realize this book existed until last week when I was doing a "where are they now" reflection on authors I loved and 2) there's no sequel. I loved Dee Dee, loved her circle of family and friends and would love to read more of her adventures. It's not likely that Sinclair will pick this character back up anytime soon, but a girl can hope, can't she?